The 134.4MW Amakhala Emoyeni wind farm near Bedford, South Africa, will feature 56 Nordex N117/2400 turbines. Image courtesy of Nordex. 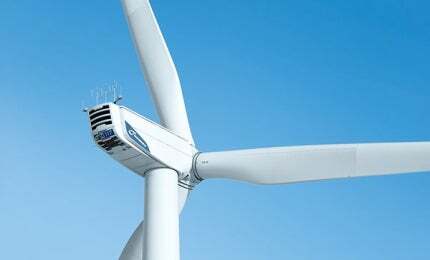 Each turbine has a capacity of 2.4MW and a rotor diameter of 117m. Image courtesy of Nordex. The project developer Cennergi signed a power purchase agreement with Eskom and an implementation agreement with South Africa's Department of Energy in May 2013. Image courtesy of Windlab. The 134.4MW Amakhala Emoyeni wind farm is a greenfield renewable project constructed near Bedford in Eastern Cape Province, South Africa. The project was developed under the Renewable Energy Independent Power Producer Procurement Programme (REIPPP) of South Africa. Construction of the Phase I of the project began in August 2014 and commercial operation began in July 2016. The wind farm is expected to offset approximately 445,152t of CO2 a year from the atmosphere. A joint venture (JV) of Exxaro Resources and Tata Power, Cennergi is the owner and developer of the wind farm. The JV purchased the rights to the project from Windlab in 2011 and owns 95% of the project, while the remaining 5% is shared equally by the Cookhouse Community Trust and the Bedford Community Trust. The wind farm is located south of the towns of Cookhouse and Bedford in the Eastern Cape Province of South Africa, and is one of the 19 renewable-energy and seven wind projects selected under the second round of the REIPPP. "The wind farm is expected to offset approximately 445,152t of CO2 a year from the atmosphere." It is a part of the greater Amakhala Emoyeni project concept, which received approval from the South African Civil Aviation Authority and the South African Heritage Resources Agency. The bigger project is spread over 27,000ha, with good infrastructural facilities such as roads and an electricity grid. The Amakhala Emoyeni project extends over 13,000ha of grazing land and incorporates portions of leased agricultural farms. It has a footprint of approximately 75ha. The wind farm comprises 56 Nordex N117 / 2,400 turbines with a capacity of 2.4MW each. The turbines have a rotor diameter of 117m and a swept area of 10,715m². Each turbine tower is made of modular tubular steel and has a height of 91m. Each turbine features a three-bladed rotor made of high-quality glass fibre-reinforced polyester, and a two-stage planetary model gearbox fitted with a cooling circuit with variable cooling output. The electricity generated at the wind farm is supplied to South Africa’s national utility Eskom under a 20-year power purchase agreement (PPA). The 350MW Wikinger offshore wind farm is Iberdrola Renovables’ first project in Germany. Amakhala Emoyeni is anticipated to supply approximately 450,559MWh of electricity a year to Eskom’s electricity network. Initial works included the construction of 35km of internal roads for the installation of the wind farm and future operations. The first 2.4MW wind turbine was erected by mid-2015. An onsite substation was built at Kopleegte, which is connected by a 132kV power transmission line to Eskom’s Poseidon substation. It is also proposed to re-align Eskom’s Poseidon-Zebra and the Klipfontein-Poseidon transmission lines, in order to transmit the power generated by the wind farm to the national grid. Financial closure for the first phase of the wind farm in Bedford was achieved in May 2013. The project was completed at a cost of approximately R3,945m (approximately $336m), which was funded through a debt-equity mix of 80:20. Cennergi is the sole provider of the entire equity for the project. The wind farm was financed by Standard Bank and the International Finance Corporation up to $72m. Standard Bank is the mandated lead arranger of the debt component. German wind turbine manufacturing company Nordex was awarded the contract for the delivery and turnkey installation of the wind farm’s turbines. The contractual scope also includes a service agreement for an initial period of ten years. Savannah Environmental was engaged to conduct the Scoping and Environmental Impact Assessment (EIA) for the wind farm. Shearman & Sterling provided advisory services to Cennergi regarding the development of the wind farm. Qunu Consulting designed the turbine foundations and roads for the wind farm.